HOLLYWOOD Large-scale marketing is being called upon as Reprise Records positions itself with two high-profile releases: Fleetwood Mac's "The Dance" and Green Day's "Nimrod." "The Dance," which reunites Fleetwood Mac's most popular lineup from the mid-'70s, debuted at No. 1, selling almost 200,000 copies in its first week (Aug. 18-24) and benefiting greatly from exposure on VH1 and MTV. "You have to do a lot of planning and we felt that whatever we could do to expose this project would pay off," says Reprise president Howie Klein. "Fleetwood Mac has an upper demo and there was nervousness (because) sometimes the audience doesn't want to come back." The return of the Mac was greeted by a chorus of Doubting Thomases who suggested the band would be lucky to sell out 6,000-seat halls and that the disc/tour would pale in comparison to the vaunted Eagles reunion three years back. Fleetwood Mac is currently selling out 18,000-seaters with a top ticket of $ 75, grossing nearly $ 1 million per night. According to an article I read in Billboard in 2003 Fleetwood Mac first approached Clear Channel to produce their Say You Will Tour. Clear Channel passed on the band thinking they were asking too high a price for their cut so FM went to the next best promoter and was signed by AEG Live. The tour was a huge success financially for the band and their promoter. Sometime between then and now Clear Channel became Live Nation and guess who has promoted Stevies' solo shows since the SYW Tour was over? "Swedish Girls Tour"--Um, Need We Say More? This week in 1975... (May 15th to be exact). Fleetwood Mac debuted their new line-up in El Paso, Texas. 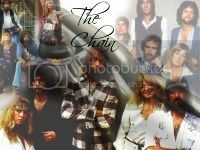 It was the first incarnation of the band that included Stevie Nicks, Lindsey Buckingham, Mick Fleetwood and John and Christine McVie. Pop Idol creator Simon Fuller is the most successful British music manager of all time, according to a major US magazine. His acts have sold 116 million units in the US alone, Billboard said. The music mogul has managed The Spice Girls, David Beckham, Annie Lennox, and many more. The magazine said he was responsible for more than 500 number one singles globally, and more than 240 number one albums. It placed him ahead of other British managers including Peter Grant (Led Zeppelin, Bad Company) and Beatles manager Brian Epstein. Fuller is probably best known for creating Pop Idol, which, with its spin-offs, has found new musical talent all over the world. What year is this? 1998? 1978? ... their influences and peers and live have colourfully been described a 'distillation of the MC5 and early Fleetwood Mac with the intensity of a plane crash'. Two shows in two days! KFMA Day 2008 crowd estimates have ranged from 24,000 to 30,000, making it possibly the largest concert crowd Tucson has seen in 30 years, since Fleetwood Mac drew 67,000 to Arizona Stadium in 1977. Fleetwood Mac- "The first songs we heard from them were 'The Chain,' 'Landslide' and 'Silver Springs.' Our parents showed us a Fleetwood Mac concert that aired on PBS in 1997 and at first we didn't get it. We watched the whole thing not knowing how much of an influence they would be to our band 10 years later. When we were told we sounded like them, we revisited the music and sure enough fell in love with it. 'Silver Springs' and 'Landslide' were our musical milestones for a while. They really set a standard of song-writing to us." On this Gawker blog, people criticized Keith Gessen for writing about political writing and compared him to FM. Guess the "Fleetwood Mac threshold" is like "jumping the shark." But in truth, Fleetwood Mac didn't often write about being in a band (although Lindsey has). They wrote more about being in love, which is universal, not something they only know as musicians. Also? Is his first novel a novel about living? No, it's a novel about writing. In music, this is referred to as the Fleetwood Mac Threshold: you've been in a band so damn long you can't write songs about anything other than being in a band. The problem with issuing that same indictment against Gessen is that he's hardly alone in writing about being a writer; there's a Sagan-esque bill-yuns and bill-yuns of books on the same topic. It qualifies as a literarily venial sin (though clearly in Gessen's case, a less than venereal sin). Last edited by michelej1 : 05-20-2008 at 11:03 AM. It's also a myth - like many of the stories about Keith. And with Keith, the truth is usually even more interesting than the myth. I totally believe it's true. Santa Monica, Calif.--On the third floor of the late-'20s former Masonic temple that houses the Village Recorder is a room visitors have rarely seen. It's an intimate-sized theater--a relic of another era, complete with a traditional proscenium-arch stage and velour curtains. "It was originally a theater where Technicolor processes were tested in the '50s," says studio president Julie Hormel. "It was a transcendental meditation center in the '70s, and the Maharishi Mahesh Yogi gave lectures here. The room has really languished in recent years, but we're going to start using it again. There's so much history in this building that I'm still learning about." That admission is especially revealing given that Hormel is the daughter of Village Recorder founder Geordie Hormel. She assumed leadership of the studio Dec. 12, 1994, and has been diligently upgrading the historic facility ever since. "I felt the place hadn't changed with the times the way it could have," she says. "My father got involved in the restaurant business in Phoenix and didn't have as much time to spend at the studio. The studio needed a fresh perspective. For me, it's been a labor of love to do that, because this is my home." Hormel has assembled a staff that includes music industry veteran Jeff Greenberg, who is the Village's CEO; former Lion Share Recording co-owner Jay Antista, who is the studio's chief of maintenance; and Robin Bulla, who is studio manager. Also on the team is Grammy-winning engineer/ producer Al Schmitt, whose session credits include Madonna, Elvis Presley, Tony Bennett, Steely Dan, Jefferson Airplane, Dr. John, Frank Sinatra, Henry Mancini, and Sam Cook. In his new capacity as the Village's audio consultant, Schmitt oversaw a comprehensive rewiring, reamping, and retuning of the facility's four commercially available rooms, Studios A, B, D, and F.
With regard to tuning, says Greenberg, "Al and I went through the rooms very carefully with (acousticians) Vincent Van Haff and Steve Coco Brandon. We redesigned the crossovers and the monitor system, because things were not sounding as good as they could." The new crossover system employed in all four rooms was designed by Brandon. Van Haff designed the main monitor systems in each studio, which combine JBL low-frequency components with TAD components for mids and highs. The monitors are driven by a biamped system consisting of Bryston 7B monoblocks for the low end and Boulder 500s for the high end. Vintage tube Macintosh 2105 amplifiers drive a selection of Yahama NS-10M, Auratone, and Tannoy SGM 10 and Gold 12 monitors in each control room. As for acoustic treatments, the Village's new management decided to tamper with history as little as possible. Much of Studio D, for example, dates back to 1978, when the room was redesigned by Geordie Hormel and Fleetwood Mac for the recording of the group's multiplatinum "Tusk" album. Stevie Nicks had much to do with the tropical motif in the studio's isolation booth, and Christine McVie chose most of the furniture. These elements and others were left intact when the studio was upgraded last year. "We decided not to mess with success," says Greenberg, "even with regard to paint and fabric. We put new fabric on the walls, but we really had to search for the kind of fabric that was on there originally. It's an old felt. We realized how every element in the room has a big effect on the sound. We were thinking about getting a real modern, good-looking hardwood floor. But we realized that the existing floor really sounds good and contributes to the overall sonic character of the room. So we kept it." Beyond sonic considerations, Julie Hormel says that some of the studios' quaint design touches contribute to the comfort level of clients. "Many of our clients like the fact that the rooms haven't changed a lot in appearance," she says. "It gives them a sense of connectedness with the past. A lot of great music came out of the era when this studio was built. So I think it's nostalgic for a lot of people in a good way. A lot of the newer bands like that, and they consider us a shrine to everything that they bring to their music." As part of the upgrade, the 60-channel Neve board in Studio B was converted to a 72-channel console, making it consistent with the 72-channel Neve in Studio D. But, in a move even more emblematic of today's trends in recording, the G-Series SSL in Studio A was recently replaced by a vintage 1974 Neve 8048. The console was originally installed at Chicago's Universal Recorders and made its way to CBS-TV's Colfax Avenue lot in Hollywood, Calif., where it was used for the Nickelodeon program "Roundhouse." From there, it was only a short trip across town to its present home at the Village. "It came to us in such clean condition that we pretty much kept it (intact)," says Greenberg of the Neve, which combines 40 in and out modules with a 32-input monitor section, 10 group channels, and two stereo masters, for a total of 88 channels. "We wanted it to be in as original condition as possible. 1974 is one of the most desirable years for Neves, and this is one of the last boards designed by Rupert Neve. Old Neve boards have become very popular in the last few years, especially for tracking dates. And since Studio A is one of the city's premier tracking rooms, it seemed the perfect place for this great old console." Completing the vintage analog vibe at the Village is the selection of Studer A-800 and A-827 and Otari MTR-90 multitrack recorders in each room, plus a comprehensive collection of microphones and outboard gear, both vintage and new. Julie Hormel has childhood memories of sessions with such artists as Fleetwood Mac and Pink Floyd. While the Hormel family is perhaps most widely known for its success in the food industry, Geordie Hormel made his mark as a musician and composer for such '50s and '60s TV shows as "Ozzie And Harriet," "Lassie," and "The Untouchables." He opened the Village Recorder in 1968 as one of the first 24-track studios in L.A. The studio's west side location and Masonic deco architecture have always made it one of L.A.'s most distinctive recording facilities. Over the years, it has hosted landmark sessions with Steely Dan, Bob Dylan, the Rolling Stones, Barbra Streisand, Ray Charles, Bruce Springsteen, Eric Clapton, Elton John, and others. Geordie Hormel has retained ownership of the Village and continues to act as an adviser, but he has turned over the studio's daily operation to his daughter and her staff. Under their leadership, the studio continues to thrive on a healthy mixture of album, film scoring, and commercial work. Recent projects include sessions for Smashing Pumpkins' "Mellon Collie And The Infinite Sadness" and scores for the feature films "To Die For," "Up Close And Personal," and "American Buffalo." In addition to the Village's four studios for hire, there is also Studio C, which has had Robbie Robertson as a permanent tenant since 1985. Ace session guitarist/composer Jeff "Skunk" Baxter also maintains a project studio within the Village's walls. "We've tried to maintain everything my dad stood for," says Julie Hormel. "An environment where people can create and feel comfortable doing it, an environment where nothing is preventing them from creating and everything is facilitating it. We like to take really good care of our clients. It's a tradition that my dad started and we want to continue." It's time for Paula and Randy to steal Kristy Lee's old horse and ride off into the sunset. We all know what a "gift" Paula is, even if she doubts that we do. And Randy and the dawg pound have served us well over the years. But it's time for the first two judges' chairs to be filled by music industry professionals actually capable of offering valid opinions, as opposed to meaningless, incessantly repeated catchphrases or incoherent rambling. And I think I've come up with the perfect replacements — one needs to look no further than '70s supergroup Fleetwood Mac. Think about it. Stevie Nicks could fulfill the much-needed "supportive female" role on the panel, but somehow you just know she wouldn't sugarcoat her critiques. As a bonus, whenever she'd get up to dance, she'd do her patented twirl and repeatedly hit Simon in the face with the awesome black lace cape she'd wear every week. And with Lindsey Buckingham in the other chair, challenging Simon to see who could leave more shirt buttons undone, we'd have a sullen, tortured genius who would interrupt his carefully thought-out comments to shoot alternately lustful/angry looks at the judge next to him. Seriously, Nigel, it's not a bad idea. Stevie and Lindsey's chemistry could rival Simon and Ryan's. Fun for everyone! This is incredible. If people think Simon and Paula argue, they ain't seen nothing yet. Simon would be a distant third when it came to interesting judges on the panel if this ever came to past. I can still remember arguing with my mom about my purchase of Fleetwood Mac’s Rumours. Mom was aghast over the implied sexual content of the cover image. She had a specific problem with Mick Fleetwood’s belt and in general an issue with Stevie Nicks draping herself over his leg. I had a problem in that, being the sheltered teen that I was, I never would’ve even noticed such raciness had she not made a big deal about it. I still have the album somewhere and can still sing along with EVERY song.